Yay! We're at the beach!! 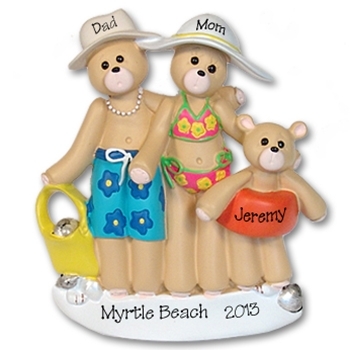 This "Belly Bear" family is enjoying their day at the beach. They are ready to hit the water and play in the sand. This ornament is extremely detailed as are most of Deb's ornaments. This makes a great gift or souvenier or vacation personalized ornament for your family or someone you know. May be easily personalized with everyone's names on the ornament. Made from resin, hand painted and designed by Debi Allison. Comes complete with hook and satin ribbon for hanging. Measures approximatly 4¾" H x 4½"